Speaking at a lunchtime conference that filled seats in the largest conference room at WWDC, accessibility advocate Haben Girma spoke to attendees about the value of designing products with disabled users in mind. 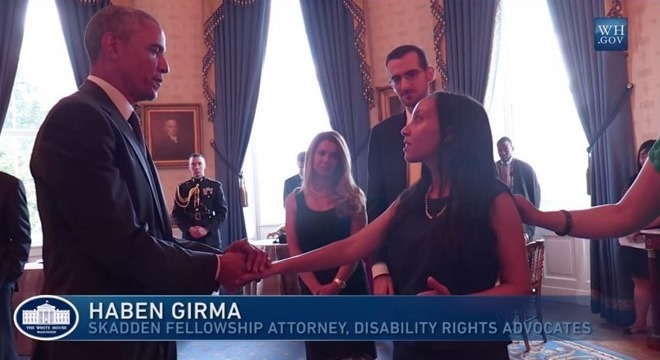 Girma, the first deaf blind person to graduate from Harvard Law School and today an independent advocate of accessibility and inclusion issues, noted that designing products with accessibility from the start not only benefits disabled users, but also benefits developers and in many cases all of their users. In an hour long conference, Girma expressed that rather than "overcoming disability," accessible design should focus on removing barriers imposed by society. She noted that decades prior, Helen Keller was denied admission to Harvard because she was a woman, and was stopped from marrying the person she loved by her family. In both cases, Keller wasn't held back by her gender or her ability to marry, but rather by arbitrary barriers erected by society and those around her. Girma profiled Apple's work in making its platforms accessible by removing barriers: Voice Over for assisting those who can't see the display; Dynamic Type for assisting users with low vision; Captioning in videos to make them accessible to deaf users and Assistive Devices that expose interfaces such as digital Braille. The goal, she stated, is a world where all apps are accessible, even in cases where it may seem unintuitive. As an example, she recited her experience in traveling to China and discovering an unknown object in her hotel room that appeared to be a fruit. Rather than sampling it, she took a photo of it and sent it to a friend, who identified the object as being a dragonfruit. In another example of the broad benefits of designing for accessibility by default, Girma described how video captions obviously benefit deaf users. However, once captioned, videos (or graphics with alt text tags) can be indexed for search. Girma noted that Apple's WWDC session videos are all captioned, and this serves as a searchable transcript that anyone can use to find specific comments made by a presenter, and then jump to a specific point in the video where the subject is discussed. Two other technology examples she cited included the invention of an early typewriter, motivated by man who wanted to overcome the barrier his wife faced in writing him letters without vision. Today, the ideas of typing by touch benefits everyone. Another example was Vint Cerf, who is described today as one of the fathers of the Internet. Himself hard of hearing, and motivated to develop a way to remotely communicate with his deaf wife, he developed an early email protocol to enable non-voice messaging. Email and texting broadly benefits eveyone today. She also profiled new ways to think about accessibility and communications, citing Apple Watch and its Taptic Engine with sophisticated vibration alerts. "Skin is our largest organ, but we have barely started to explore haptics," she noted. Apple has long worked to make its products and software accessible, resulting in a series of awards from disability advocates.